The book Zakka Syle has a pouch pattern called the Orchard Path Tweed Pouch by Amanda Jennings. I can’t call mine a tweed pouch because I opted to sew it using linen and ultra suede. I’m really happy with how it turned out except that I was hoping it would fit my Kindle and it does not. If I had done the zipper differently, it probably would have fit. I followed the suggestions of this week’s Zakka Sew Along host(ess) Elizabeth from Don’t call me Betsy. 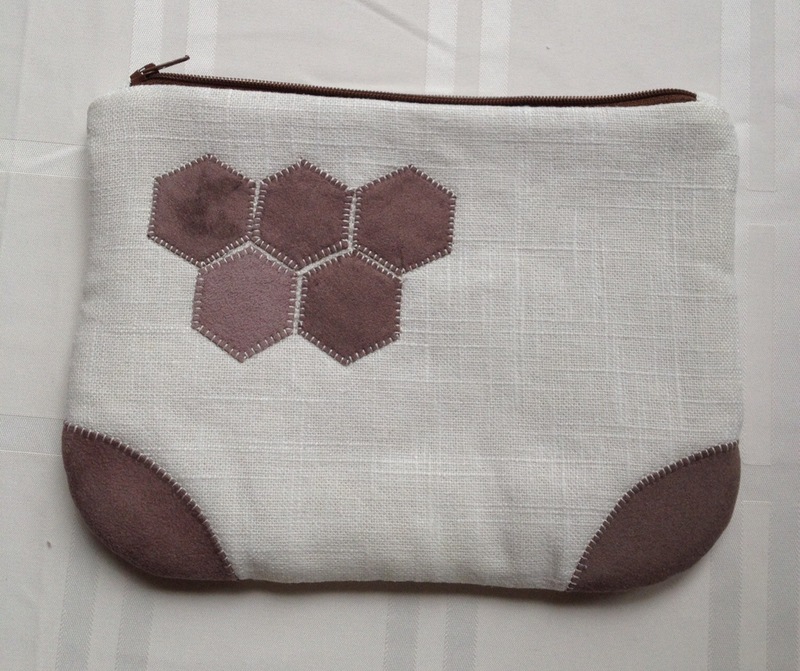 She suggested following this zippered pouch tutorial from Kelbysews. I love the way that it went together and the finished look of the zipper. This neat technique made the zippered opening a bit smaller. I also cut my zipper smaller than I should have which caused me to sew the pouch with a 1/2 inch seam allowance instead of a 1/4 inch. These two things made just enough difference that my Kindle would not fit in there. I may try again because this made up pretty quickly and would be even quicker after having already done one. 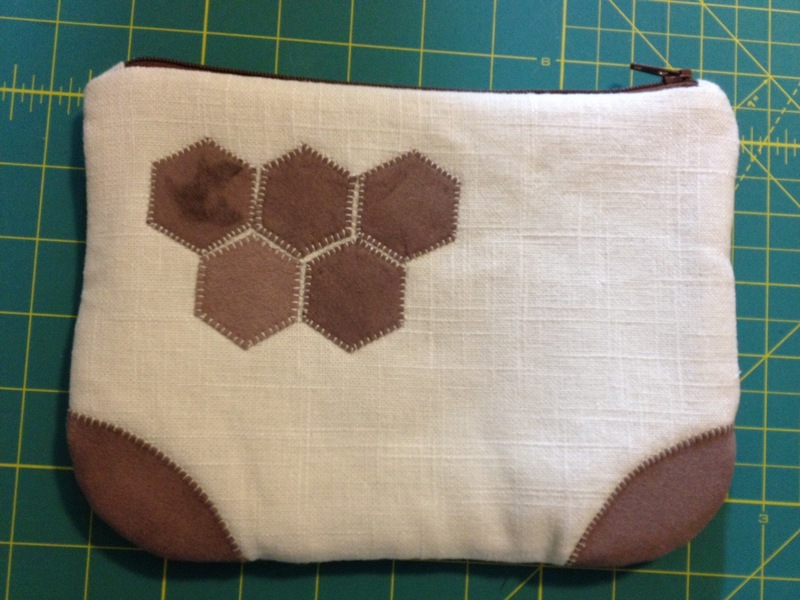 Using ultra suede on the bottom corners and the hexies (?hexes) meant that I didn’t have to do any turning under. Pattern pieces – note the difference? The book has you enlarge the pouch pattern 200%. The corner pattern and the hexagons are printed real size. I found that the corner pattern did not exactly match my enlarged pouch corners. They were just a slightly different shape and size. I opted to cut off a corner of my pouch pattern and use that to cut the ultra suede. This way they were perfect! Good luck to everyone who is sewing this project this week as part of the Zakka Style Sew Along. It’s a great one! Yippee! I got the quilt done and I LOVE it! I thought I had gotten a jump on this project by deciding the layout a few weeks ago. 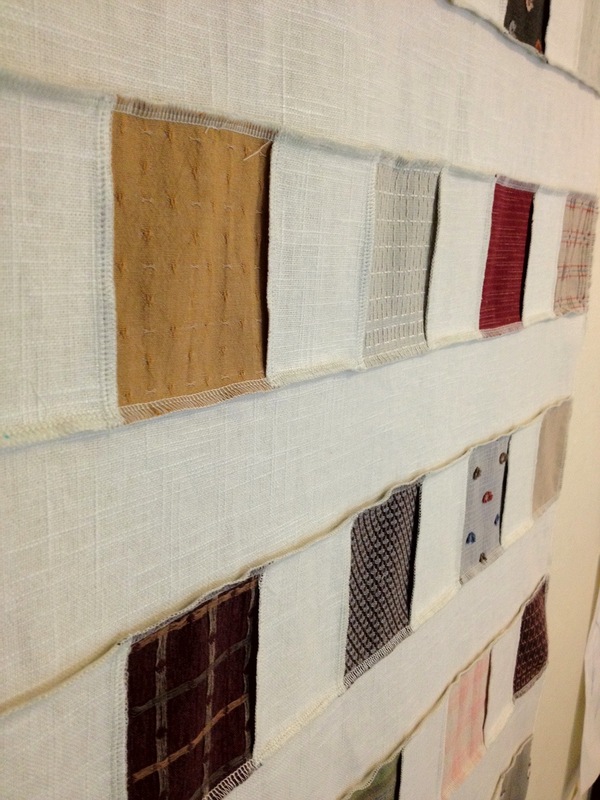 However, all the sewing, quilting and binding was done this week – mostly in the past 3 days. Luckily my husband was out of town and I didn’t have too many other responsibilities. 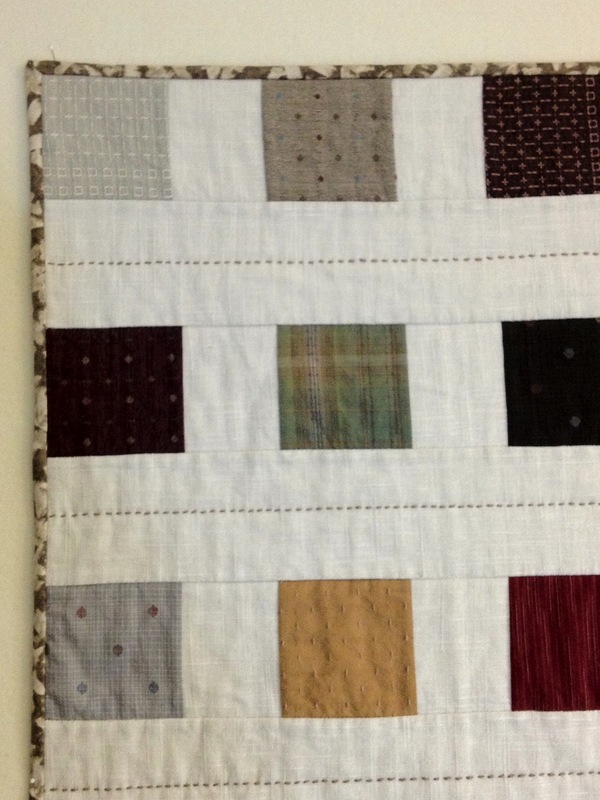 I used a charm pack of woven japanese fabrics which are 4″ square. There were 70 squares in the package and I needed 72. I supplemented by cutting some similar fat quarters that I had. I used cream colored linen for the rest of the top and a cotton fabric for the binding and back. 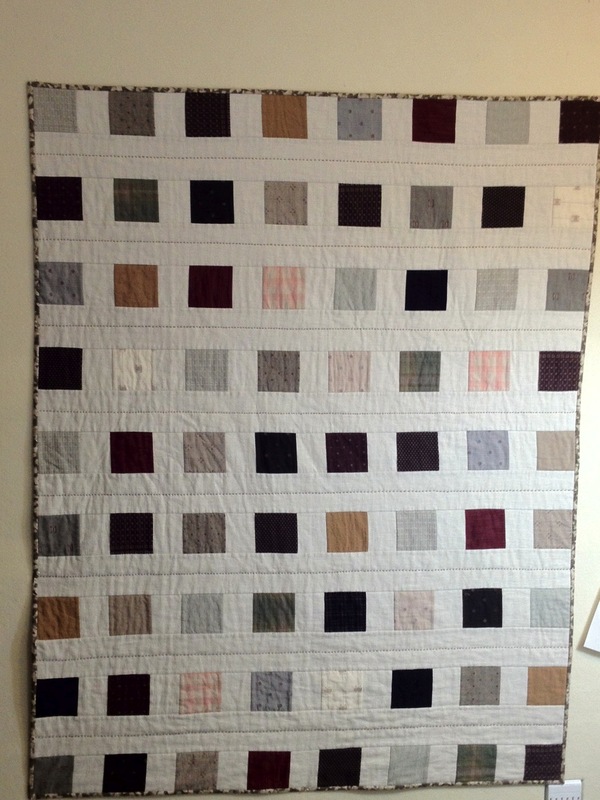 I put the quilt together with my serger. The linen and the woven fabrics were a loose enough weave that they were fraying like crazy so I thought this would be a good idea. Look at how neat the back is! I’ve only used my serger for garment construction and edge finishing (150 cloth napkins for my daughter’s wedding) in the past. This project was the PERFECT project to serge because of all the straight lines and it went together very quickly this way. 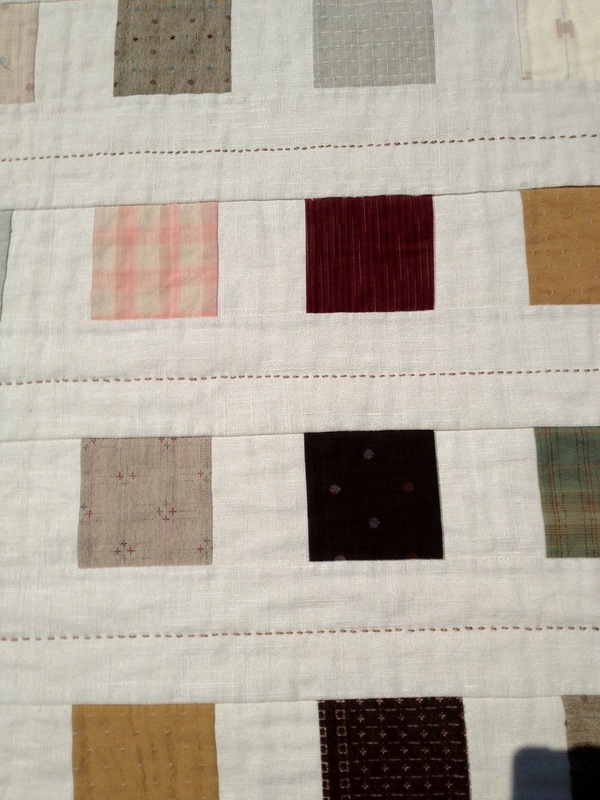 I did stitch in the ditch with thread that matches the linen along the seams on the top and bottom of the blocks. 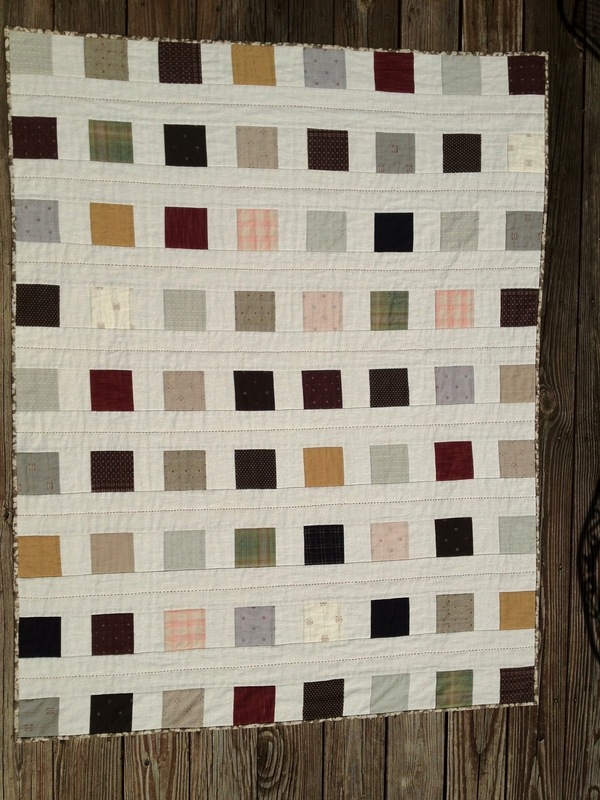 This did a good job of stabilizing the quilt. This loosely woven linen really wanted to lose it’s shape. Next I did the hand stitching with a thick pearl cotton thread. The hand stitching was definitely the most time consuming part of this project, but I’m SO happy that I did it because I love how it looks and it reminds me of sashiko stitching which seems appropriate with my japanese fabrics. I wonder how many other Zakka Sew Along sewers are scrambling to get their quilts done today in order to link up for this weeks “prize”. Good luck everyone! Stamping on fabric. What do you use? I’m sewing my way through the book Zakka Style by Rashida Coleman-Hale. This week’s project is a small sewing kit with pincushion. This is a quick and easy project to make up and I used several stamps to personalize mine. 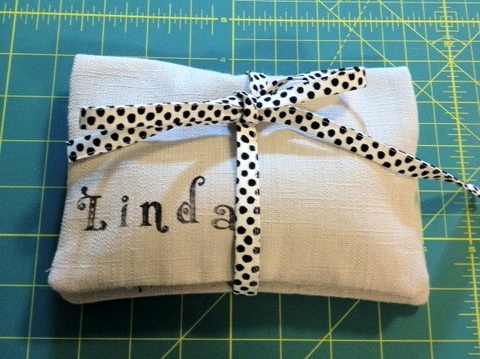 I would like to do more stamping but have had trouble finding the right supplies for fabric. I would love to know what other sewers have had success with. In particular I would like to know which products give a detailed imprint and are also permanent and washable. I’ve been using clear stamps mounted on an acrylic block. These stamps are fairly shallow. A rubber stamp would probably be easier to use, but I love the variety of these clear stamps. The large owls on the pockets of my sewing kit were done using a liquid acrylic called NEO OPAQUE by Jacguard that I bought at my local art supplies store. I bought a glass artist’s palette to pour a bit of the ink on to and then a brayer to smooth it out. I tried both touching the stamp to the ink and also using the brayer to ink the stamp. Both ways worked “just okay” – especially on the textured fabric that I’m using. After doing a bit of research on the web, I ordered some different products made by VersaCraft. I bought an ink pad (which is smaller than I thought it would be when I mail ordered it – don’t you hate that? ), some ink to reink the pad, and a dual tipped marker. I used these to stamp my name on the kit and the small owl on the pincushion. I was glad that I had bought the marker because I was able (with the small tip) to darken the areas that needed it – and they did need it. I did heat set all of the images I stamped, but since this project will probably never be washed, I don’t really know if it is permanent.